Read more in Intel's 10nm production node. 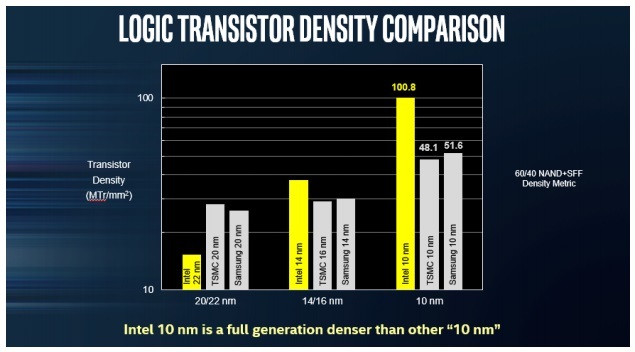 This means that Intel's 10nm is expected to produce chips with a lower cost per transistor and offer more transistors per unit of die area. so do we really think intel will be cheaper than the competition... uhm? This will be the latest supposed justification for their gouging tactics. Hopefully they'll fall flat on their faces and learn something from the experience, but I doubt it. He did not say it would be cheaper than the competition. Just that it's cheaper for them to produce. This is really impressive stuff. And glad to see they want standardised measurements. These slides are targeted at investors, not consumers.